While the number of candidates running for Student Government’s executive branch have decreased, the campaign events continue – including the Executive Ticket Debate. With only one ticket running and actively campaigning for executive positions, the debate was reformatted into an interview. The event allowed the “U First” ticket to speak about policy and initiatives it hopes to institute during the upcoming 2018-2019 academic year. The hourlong debate, co-hosted by The Miami Hurricane and UM’s chapter of the Pen and Sword Society, drew a crowd of about 20 students on Feb. 7 to the Lakeside Patio Stage. 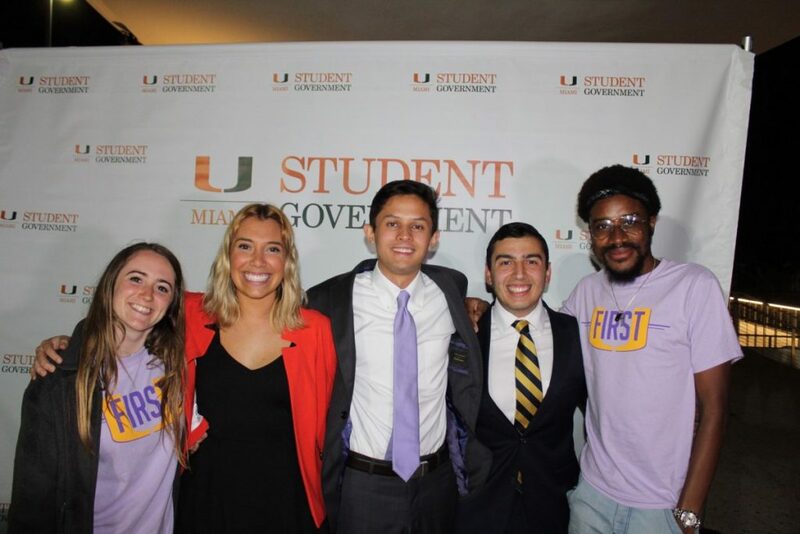 The three candidates, all juniors, on the U First ticket – presidential candidate Evan De Joya, vice presidential candidate Catherine De Freitas and treasurer candidate Rafael Cariello – provided more details about their seven-point concept-based platform. Although U First is the only ticket actively campaigning, other students who dropped out of the race after the registration deadline will still appear on the ballot. The biggest issue with UM subsidizing the cost of ride-sharing services is that these companies do not want to assume full liability for students who could be injured while using the service, Cariello said. The candidates said their subsidization plan is budget-neutral because it will replace underused shuttles routes. The ticket also said it is considering charging students a fee which would potentially be matched by ride-sharing services and the university. The current Student Government administration that ran as “Unlimited” in 2017 had a similar initiative on its platform, which has not been enacted during its tenure. However, U First said its approach will make the initiative more likely to be approved by administrators. “Ultimately, it won’t cost the university more money if it’s done right, and I think that is a lot more appealing to upper levels of the administration because it wouldn’t end up adding to the budget,” De Joya said. Internship, career and graduate school opportunities pop up left and right in college; however, interviews are often held during class time. One of U First’s initiatives is to revise the university attendance policy, with the input of the Toppel Career Center, to treat career interviews as excused absences, like religious holidays or university events. U First will work with UM Dining and students to increase food options near classroom buildings, including potentially replacing the Half Moon Empanada cart near the Dooly Memorial Building. The ticket has proposed adding an automated umbrella rental system called “‘brellaBox” around select buildings on campus. The system would be linked to students’ CaneCards and work similarly to umbrella rentals already in place in some residential colleges. De Freitas, a member of Delta Gamma Fraternity, said she would host an open forum on sexual assault in light of recent concerns across college campuses, similar to ones held by Greek Life organizations last semester. The U First candidates said they had not seen the recommendations from the Women’s Center Task Force but would look into it. If elected, the U First ticket will issue monthly progress reports, shared with students through email or social media. The candidates said they will work with schools and colleges to create consistency in course content, grading and assessments in commonly taken introductory-level courses that can vary greatly across different sections. Cariello said in order to make progress for students, U First wants to work with Student Senate members and focus on cross-collaboration among student leadership organizations. U First will work with the Department of Parking and Transportation to discuss options for adding more lighting and cameras in university parking lots. De Freitas said one of the biggest complaints they’ve heard from students is the concern for safety when walking around campus – and specifically the parking lots – after hours. The members of the ticket said they will work with the Chair of the Energy and Conservation Organization to ensure students are aware of the sustainability initiatives across campus, including what they can do to help campus be more eco-friendly overall. The candidates said they will work closely with Greek Life organizations to support more philanthropy events, such as “Greek Week,” to support positive Greek Life involvement on campus. U First candidates said improving the game-day experience is important, and they hope to improve student turnout on game day. The ticket is proposing to improve the signage and accessibility for students to navigate around Hard Rock Stadium. U First is also proposing to have more pre-game activities available to students, such as DJs. Student Government voting will take place Feb. 12-14. Results will be announced at 5:30 p.m. Feb. 15 at the Lakeside Patio Stage. Students can vote at sg.miami.edu/vote. Voters will be entered in a drawing for a chance to win a Starbucks gift card. Correction, Feb. 9, 2018: A previous version of the article said that “U First” would work with the Office of Sustainability to increase environmental awareness, but the ticket clarified it would instead work with the Chair of the Energy and Conservation Organization to promote its initiatives. Is the next Elon Musk a fraternity brother at UM?